HELIKON TEX WOMEN'S URBAN TACTICAL PANTS AND TEE REVIEW! Hey everyone! So my friends over at Military 1st were kind enough to send me a couple of products from the fitted ladies tactical clothing line from Helikon Tex. After seeing the ladies line at IWA 2016 I was keen to see how these products performed as we all know, there isn't a great deal of tactical clothing out there for women. 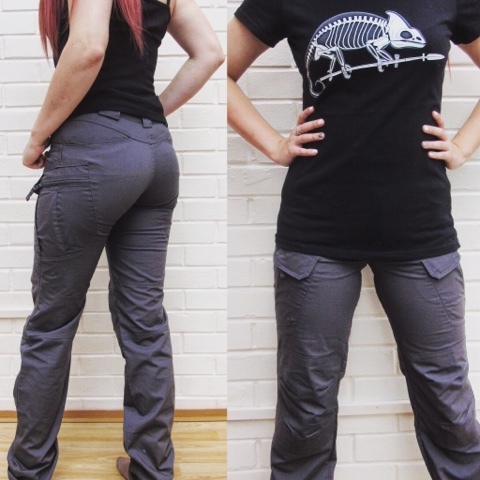 So the products in my care package were the Ladies Urban Tactical Pants in Shadow, the women's Helikon Chameleon Skeleton T shirt, and the women's T Shirt in Coyote. First things first, with these trousers it is really important to measure your body and check the sizing, In mens/unisex combat trousers I usually wear a 28" waist, 32" leg and they do the trick but as these are an extremely fitted pair of trousers I had to measure my waist and hips to make sure I had the correct size. I'm a size 8/10 in most jeans/trousers etc and worked out my size to be a 30" waist. When the package arrived at my house (very speedy delivery) I opened it up excitedly and immediately started inspecting the stitch quality and materials - not many of you will know this but I have a degree with honours in Fashion and Textiles so build quality and materials of garments is one of the key things I look out for in any clothing I wear. I was very impressed with the feel of the material, it doesn't feel or look cheap - has a little stretch to it and is a durable 2 way rip stop blend fabric - perfect for the field. Looking at the overall construction of the garment it was solid and with this I threw them on so let's check out the fit. So these are designed specifically to fit the anatomy of the female form and have a classic jean neck shape to prevent the trousers from slipping down. I am very happy with the fit, they are comfy and not too restrictive. After putting these through their paces off the field with squats, running during my daily fitness routine for most activities, especially for range days the size is perfect however if I were to wear these for an Airsoft game I would probably opt for a size bigger because I like my trousers to be a little looser to enable a better range of movement especially when I'm crawling under/climbing over or through obstacles to get those kills on the field. The trousers are very fitted around the waist, hips, buttocks and thigh areas and loosen up around the knees. The length of the trousers is 34" no matter what size you opt for and this is to give the user greater freedom in choosing their leg length - just fold them up and you're good to go. I for one quite like the long leg. 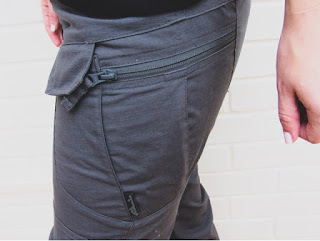 They feature a elasticated waist and zip/velcro fastening which gives them a little movement around the waist and keeps them securely fastened. There are 7 wide belt loops which are perfect for loadout belts for holsters, mags etc. I feel pretty confident when I say that it is unlikely that you would need a belt to keep them up. They also come equipped with 12 pockets - two front pockets with strengthened edges, two wide back pockets, two slim back pockets for accessories, two angled internal waistband pockets, two zipped thigh cargo pockets and two velcro thigh pockets. 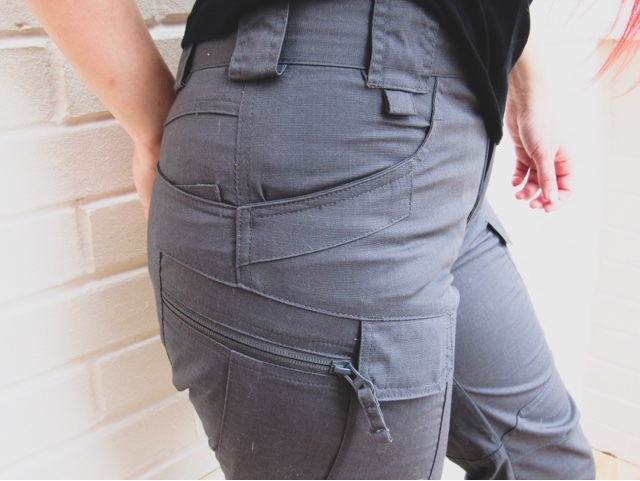 Although I think the amount of pockets is exceptionally useful and they do enhance the overall aesthetics of the trousers, I only really used the zipped/velcro and the waistband pockets. I liked the security of the fastened pockets and my iPhone fitted well in the waistband pockets. They come in 4 colours - shadow, black, khaki and olive drab, I opted for the shadow grey colour as I'm really loving that shade at the minute. It is somewhere in between the Mechanix Wolf Grey and Viper Titanium, a nice, dark grey/blue colour that goes perfect with a black loadout. Lastly, let's talk prices. 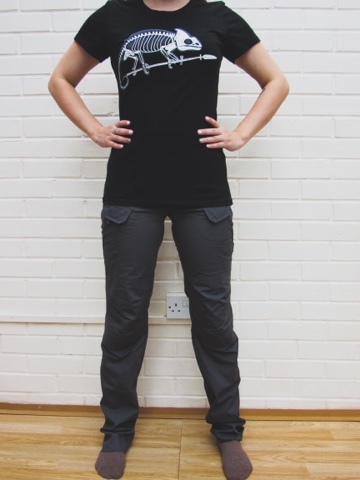 From Military 1st the shadow colourway is £53.00 with free shipping which is a little more pricey than the unisex trouser options but cheaper than other brands who also offer ladies cuts such as 5.11 Tactical. For the quality of the construction, material and fit, I feel the price is justified. Overall, I found it very hard to dislike anything about these trousers. Next on the list is the Helikon Chameleon Skeleton T Shirt in black, this part will be short and sweet. I chose a size small which is the size I usually wear in tops and as you can see from the photo, it fits very well. I especially like how long line the shirt is, reaching the top of the pockets. The design is pretty cool and I have worn it out casually not just on the field. The material is soft and comfy and at a price of £10.50, is there really anything to dislike? Not in my books! 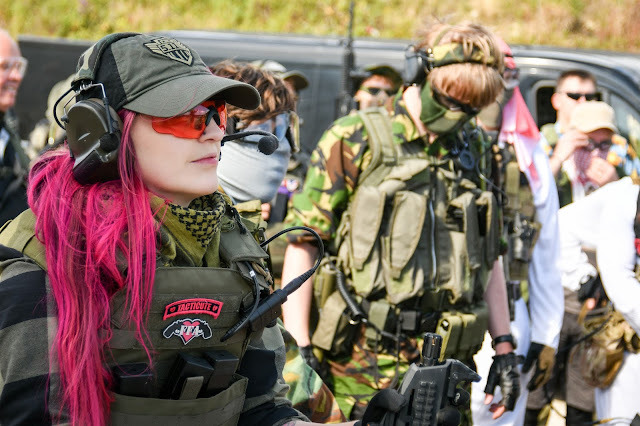 It is great to see companies recognising the growth in numbers of women in shooting sports and catering for us so Helikon Tex get a thumbs up from me and thank you to Military 1st for the opportunity to test out this great line of gear.